My Pal Roger is delightful story about Onesock and his misadventures with the newest family member, Roger the dog, who bounces into his world and develops a liking for Onesock’s favourite toy. Although it isn’t mentioned in the story, Onesock has Autism and displays behaviours associated with this. Like many children with autism, Onesock has sensory issues with his clothing, in this case with his sock. He has difficulty with social situations and changes to his environment, such as the introduction of the new pet or visiting his Grandparents. Onesock has a particular attachment to his toy alligator, which he uses for comfort and to transition through difficult situations. When faced with a trip away from home, and a new dog that keeps trying to play with his toy alligator, Onesock becomes distressed and anxious. Things are resolved when Roger saves the day. It is no surprise to learn that the author, Roy Ruiz, is the father of the real life Onesock. Onesock is portrayed with love, respect and acceptance. There are subtle interactive elements on each page indicated by sparkles. Touching some of these might activate an environmental sound, such as a dog bark, a giggle etc, but other interactive spots play more dialogue in the voice of the character, so you can learn more about how the character is feeling. I love that! An option for clicking individual words to hear them spoken when in “Read Myself” mode. This would help those children who are mostly independent readers, but who struggle with the odd word. More Onesock adventures – I’ll buy these as soon as they are published. It is a joy to see a story with an autistic child as the main character in a story. Given the prevalence of ASD in our communities, children with ASD have been under-represented in all forms of media and particularly in children’s literature. Any child will enjoy reading about the adventures of Onesock, but the story will resonate with families affected by autism. I was happy to part with a measly 99c for a story of this quality, and I’d happily pay more. 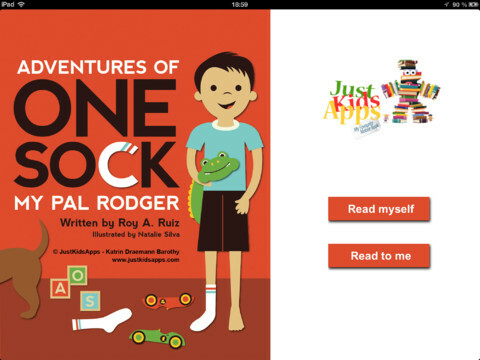 This is the second of Ruiz’s Onesock books, but the first available as an app. 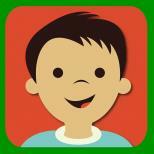 JustKidsApps timed the release perfectly to coincide with World Autism Month in April, 2013. If you’d like to know more about Onesock’s adventures, JustKidsApps or the app, see the links at the end of this page. If you’re thinking about introducing a pet into your family, want to understand a little more about what it’s like to be autistic, or just want to enjoy with your kids a sweet story about a boy, his toy and a new pet dog, then this book app is for you. “I have good news and I have even better news!” Daddy announces at the beginning of the story. The good news is that the family, including a little boy nicknamed One Sock, are going to spend Thanksgiving at Grandma and Grandpa’s house. Our hero’s constant and dearest companion is his favorite toy, Alligator. Unfortunately for both One Sock and his stuffed playmate, the family’s newest member, Rodger the dog, also takes a strong liking to Alligator. As the action moves to Grandpa and Grandma’s house, Rodger’s fixation with One Sock’s toy persists, much to the little boy’s distress. Then, to make matters worse, Alligator gets lost! Will One Sock’s beloved toy be found? Will he and Rodger ever become friends? Download the app now to find out! – Colorful and stylized illustrations by Natalie Silva, that both kids and grown-ups will love. 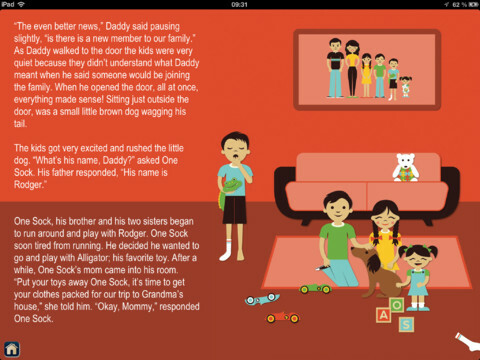 – Interactive audio elements, plus kids can play ‘find the missing sock’ on each page. – English and German versions of the story. – Both language versions include a ‘Read myself’ and a ‘Read to me’ option. – The ‘Read to me’ option is narrated and includes text highlighting to support the development of early reading skills. – English narration is by Priya Rana Kapoor, a Human Behavior specialist, life coach and soon-to-be author. – Changes in his environment, particularly surprise ones like the arrival of a new dog, can be difficult for him to adjust to. – Alligator is very important to One Sock as a transition toy – something familiar and comforting that eases his anxieties. – Sensory issues can make clothes (like socks!) uncomfortable to wear. – Social skills like sharing can be very difficult concepts for him to learn. Whatever your motivation in downloading this app however, you and your kids are bound to enjoy the story’s timeless and universal themes involving family, cherished toys and a little boy and his dog – his pal, Rodger.